With less than a week left before most kids in Canada go back to school many families are out doing their last minute shopping for clothes and supplies. If you happen to be doing that shopping online and haven't done so yet you may want to funnel that shopping through airmilesshops.ca as they offering up to 1,000 bonus AIR MILES when you shop at multiple partners until September 9. Make purchases of $20 or more per store at two stores and you'll receive 100 bonus AIR MILES. Make purchases of $20 or more per store at three stores and you'll receive 300 bonus AIR MILES. Make purchases of $20 or more per store at five or more stores and you'll receive 1,000 bonus AIR MILES. Simply visit airmilesshops.ca for complete details! Hilton emailed us last night with the details of their next global system Honors bonus points promotion. It is essentially a continuation of their double points on all stays worldwide that we have now seen for quite some time however for this version there is an extra bonus if your stay is at a luxury or resort location in the Hilton family of hotels. That bonus is triple points per stay at those 243 specific locations. 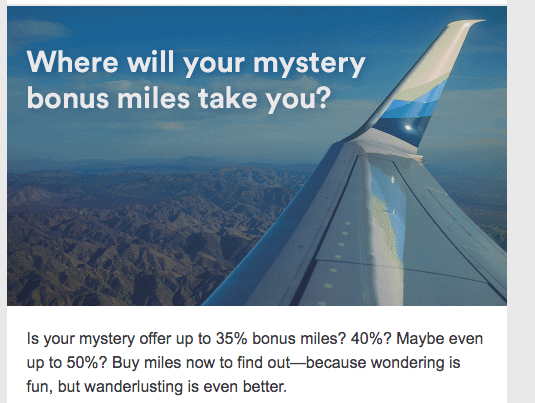 Just as we saw at this exact time last year (well within 2 days) Alaska Airlines has once again brought out their mystery bonus for buying Mileage Plan miles. The bonus can range from 35% to 50%. The bonus depends on the member and will be revealed when you log in to the buy miles page. Seeing that you can redeem miles for premium class flights on British Airways, Cathay Pacific, Hainan, Korean Air and more, there are lots of options for you to use these miles. 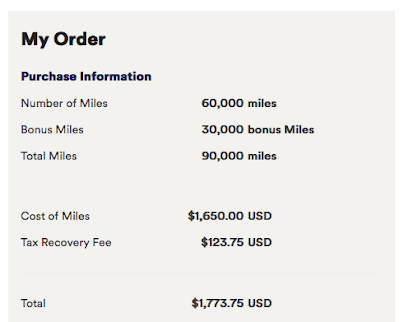 Remember it only takes 70,000 Mileage Plan miles to fly Cathay Pacific First Class from North America to Asia and that flight alone will cost a lot more than US$1,773.75! Remember there is no maximum limit on miles you can buy - it strictly limited to 60,000 miles per transaction so you can make multiple purchases if you like. Many frequent flyer programs have allowed you to earn miles or points on vacation packages and even redeem miles or points for vacation packages. However you have never been able to earn elite status qualification on vacation packages with these programs and in what we believe to be an industry first, WestJet rewards becomes one of the first programs to now award elite status qualification with the purchase of WestJet Vacations packages. Unless you buy a lot of vacation packages (or buy really expensive ones - think Sandals or Beaches) chances are you won't reach an elite status on them alone but they will definitely help build your qualification amount up if you do fly with WestJet regularly as well. Also, effective August 20, 2018, Gold members will see an increase in the WestJet dollars they earn on WestJet Vacations packages. For all bookings made on or after August 20, 2018, members in the Gold tier will earn 1.5% back on their individual portion of the base package price of an eligible WestJet Vacations package. Members in the Teal and Silver tiers will continue to earn at 0.5% and 1% back, respectively. It appears the Aeroplan Air Canada saga may have come to a close today! It has just been announced that the consortium of Air Canada, TD, CIBC and Visa have reached a deal to purchase Aeroplan from its parent company Aimia. It appears that Aeroplan's posturing and Aimia'svaluation of $450 million has been met by the consortium. It is still subject to negotiation which really should only be for ironing out some minor details. I would have to say everyone can relax, take a breather and be happy you won't have to rush out and use up your miles...... although we still don't have details of the new program come 2020 that Aeroplan will be rolled into. Here's to crossing our fingers that Air Canada doesn't mess it up hugely. Oh and seeing that TD, CIBC and Visa are part owners there is a good chance that American Express will be out as a partner. TORONTO, Aug. 21, 2018 /CNW Telbec/ - Air Canada, The Toronto-Dominion Bank ("TD"), Canadian Imperial Bank of Commerce ("CIBC"), Visa Canada Corporation ("Visa") (collectively, "the Consortium") and Aimia Inc. ("Aimia") announced today that they have entered into an agreement in principle for the acquisition of Aimia's Aeroplan loyalty business. This past weekend marked the official integration of the Marriott, Ritz-Carlton and Starwood Preferred Guest hotel loyalty programs. While integrated, the three programs will still run under separate names until the new year when a unified program name and name for the currency will be revealed. So right now, the currency is being simply referred to as 'Points' and we still have the Starwood branded credit cards until then. In anticipation of the integration the Starwood Preferred Guest Credit Card from American Express was pulled from the market temporarily in late July. It had already gone through one transformation earlier in the year when the typical bonus points offered for getting the card was replaced with hotel credits. We knew that the U.S. card would be getting bonus points offer back as those details were revealed several months ago. At that time we asked Amex Canada if the same thing would happen here and they said it would but wouldn't reveal what the offer would be. Fast forward to today and we now know what the offer is with the relaunch of the card today. 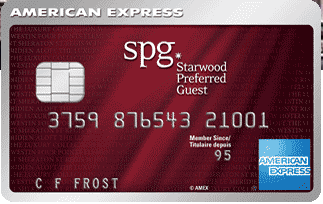 The Starwood Preferred Guest Credit Card from American Express will now offer 50,000 bonus points in the new program when you spend $1,500 on the card within 3 months of approval. Now 50,000 points may sound big but you have to remember those are points for the new program (well essentially Marriott Rewards points) and those are worth 1/3 of what Starpoint was worth before the integration. To compare apples to apples, this 50,000 point sign up bonus is the equivalent of 16,667 Starpoints and you will probably recall the card offered a 20,000 Starpoint bonus for the longest time, with 25,000 being recently offered for old Marriott Visa cardholders. The base sign up bonus on the card was 15,000 Starpoints but we hadn't seen that in several years so one could take 20,000 as the level to compare to the new card. This means the new sign up bonus is nearly 17% lower than what we were accustomed to. Here's the thing though, 50,000 points is still a pretty good sign up bonus based on the new combined program award chart. Its value, anywhere from $400 to $500 is still significantly higher than many other card sign up bonuses in Canada. It can get you up to 10 nights in a Category 1 hotel during off-peak times, 4 standard nights in a Category 2 hotel, 1 night in a Category 6 hotel during standard times or even Category 7 for off-peak. Still 60,000 points (which would equal 20,000 Starpoints) would have been an ideal bonus offer to offer on this card, at least for a limited time, to soften the blow of the lower card earn rates and lesser elite benefits in the new program. The sign up bonus is not the only decrease on the card, as we previously revealed in June, the everyday spend earn rate on the card is also lower. The card will earn 2 points per dollar spent. This is a down from the previous earn rate of 1 Starpoint per dollar spent which was equivalent to 3 Marriott Rewards points. So it is a 33% reduction in earn for most spending made on this card. For Marriott and Starwood purchases, the new earn rate is 5 points per dollar - again another devaluation from the previous promotional rate of 2 Starpoints per dollar or 6 Marriott Rewards points. On the bright side, as we already knew as well from the post in June the card does now come with annual free night award without the spend requirement that was on the previous iteration of the card and it also includes automatic Silver Elite status which isn't much but better than nothing I guess! The card also retains Gold Elite status after $30,000 in spending however that elite status level has lost some lustre in the new combined program. 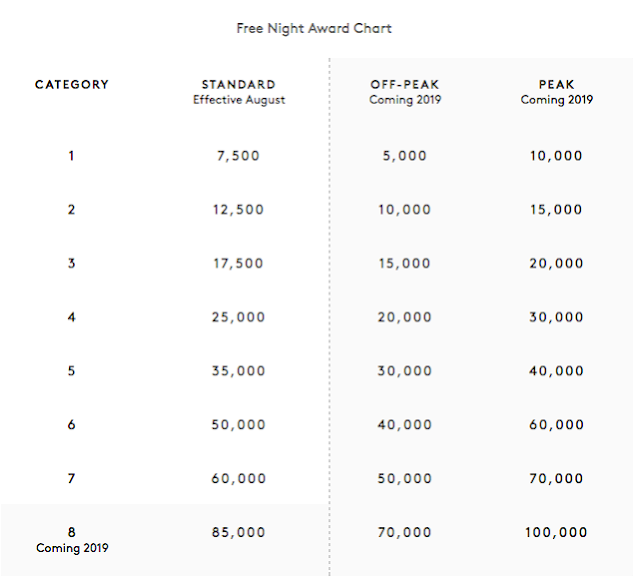 It has also been mentioned in literature from American Express that the card will provide elite night credits starting in 2019. Our guess would be 15 like we saw on the Marriott Visa card. It is unfortunate to see what has been one of the best cards in Canada take some of these hits to what made it so good. I know some people may not get the card now but the value is still relatively high when comparing it to other cards in our market. For us, we already have this card in our family card portfolio and will keep it for the annual free night, the elite night credits that will come in 2019 and for paying for our Marriott and Starwood stays. How about you? Will you apply for the new version of the card? Or if you already have it will you keep it? Let us know in the comments section below! To learn more about the Marriott SPG integration please visit our resource page here. Today is your last day to book hotel stays (paid or reward) separately from the Marriott Rewards and Starwood Preferred Guest programs. As of tomorrow the programs will be integrated. If you have been holding out to book a reward stay and it's at a hotel that is going up in price as of tomorrow you only have a short period of time today to get it for lower points! Visit our resource page on The Marriott Rewards Starwood Preferred Guest Merger for all the details about the merger. Stash Hotel Rewards have a flash sale where you can save up to 55% off on stays at their partner hotels. Find out more here. Make your summer one to remember with the Hilton Sale. Save up to 25% off breaks across Europe, the Middle East and Africa. To access our best savings, simply join Hilton Honors for free while you book. With hotels in over 100 locations, there is a break for every occasion. Stays must be booked by September 3, 2018 and completed on weekends until October 7, 2018. Remember that you should also be earning Double Points on these stays with the current summer Hilton Honors promotion that runs until September 9. Find that and all other Honors bonuses here. Discounts are up to 15% off the Best Available Rate and Best Available Bed & Breakfast Rate and vary by property, excluding Hampton by HiltonTM hotels where the discount is up to 10% off. The Summer Sale Hilton Honors member rates are an additional 10% off the Best Available Rate and the Best Available Bed and Breakfast Rate, for weekend stays. Here are the Rewards Canada Top 5 Credit Card Sign Up offers for the month of August! This is not a 'best' credit card list like our Top Travel Rewards Credit Card rankings but instead a look at cards that have very good acquisition (sign up) offers. As always when choosing a card you should always take other factors into account other than the just sign up bonus, but when most or all of these cards are first year free, they can and do pay off even when you grab them strictly for the sign up rewards. In fact all of the cards on this list are first year free or have no annual fee so you can try them out at no cost and decide later on if the card is right for you. All the while you earn the sign up bonus which can be used to subsidize your travels! 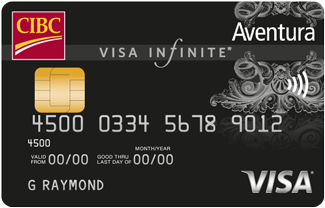 Only one change this month as the first year free offer on the RBC Visa Infinite Avion is no longer available. 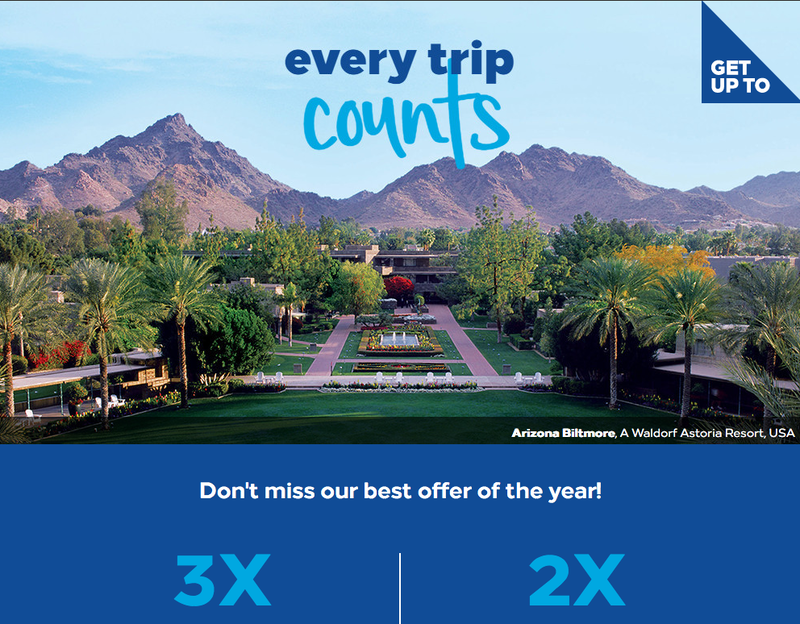 That offer has been replaced with the no annual fee mbna Best Western Rewards Mastercard. Included in the revamped BMO Rewards program that essentially sees the program devalued the BMO Rewards Mastercard has never been on this list before. It now makes the list because it actually has a limited time sign up bonus and the card has no annual fee so these 20,000 points (worth ~$142) come to you at no charge. 10,000 points are awarded after the 1st purchase and then 10,000 more if you can hit $1,000 in spending in the first three months. The CIBC Aventura Visa Infinite card now offers a 15,000 Aventura Points sign up bonus worth up to $300 in travel depending on what type of flight you redeem for and since the annual fee of $120 (and supplementary cards are waived as well) those 15,000 points come at no cost to you. The current offer also includes a $100 travel credit if you book travel via CIBC! This is first time we have featured a HSBC card in the Top 5 list as HSBC makes a big acquisition push for their newly released World Elite Mastercard. The card has a 20,000 point welcome bonus and then awards another 10,000 points when you spend $1,000 on the card within 90 days. All of this of course with the first year annual fee being waived! Those 30,000 points are worth $150 in travel rewards. Those points can also be converted to British Airways Executive Club, Cathay Pacific Asia Miles or Singapore Airlines KrisFlyer. Also of note is this card has no Foreign Transaction Fees! The mbna Best Western Mastercard is a no annual fee card so there isn't a time limit to grab it but it is one you get now, cancel and grab again in the future. The 20,000 points is enough points to redeem for one to two nights at many Best Western hotels or you can even convert them to one of Best Western Rewards airline partners like Aeroplan or British Airways. The 20,000 points equates to 4,000 miles in most of their 20 airline partner programs. August 14 Update: Aeroplan Moments Worth Millions returns, Marriott/SPG outages starting tomorrow, new WestJet routes & more! As the August 18 integration of Marriott and SPG quickly approaches they programs have been sending out emails to their members advising them of intermittent system outages starting on August 15 for Marriott Rewards and August 18 for SPG. This all to do with the launch of the combined program! Short term pain for long term gain hopefully! Also announced since our last update is WestJet's winter 2018/19 schedule that will see new flights between Calgary and Montego Bay, Jamaica as well as between Saskatoon and Orlando.Along with these new routes there increases to frequencies on a lot of WestJet's routes. You can find all the details out on these new routes here. It has been a few months since we have predominantly featured the Air France KLM Flying Blue Promo Rewards here on Rewards Canada. This has been due to a couple of reasons - two months ago it was because there were no Canadian cities included and for July... well, I kind of forgot about it! 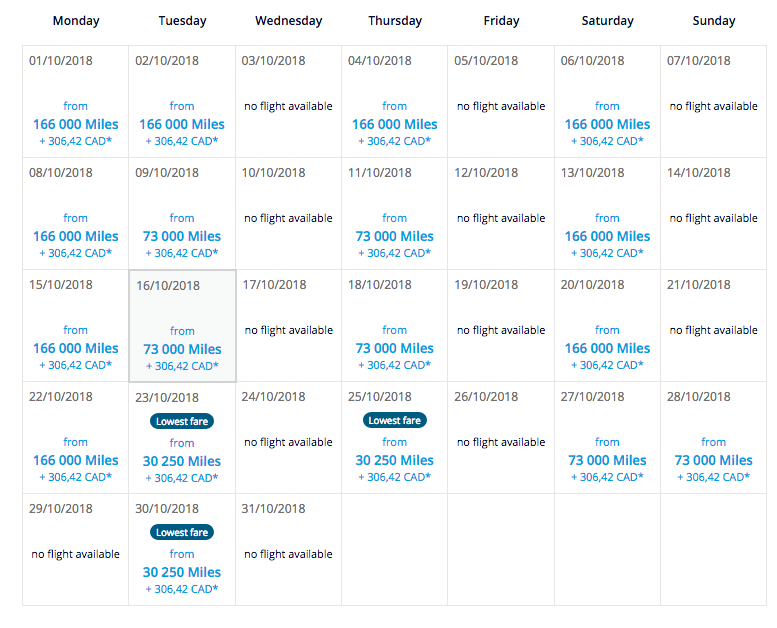 Since the last time we covered this promotion, Flying Blue introduced their new award pricing that has done away with the traditional award chart and moved to dynamic pricing. There are both pros and cons to this when it comes to Flying Blue's Promo Rewards. The pro is that there are routes/times the miles required will actually be less than they used to be with the old Promo Awards - yes the used to be Promo Awards and are now called Promo Rewards 🤷. While the con is that there are routes/times that may be higher than they used to price at. Also the dynamic or variable pricing doesn't always make sense on as you'll find out below. Now onto the actual newest set of Air France KLM's Promo Rewards! This time we only see three Canadian cities included. 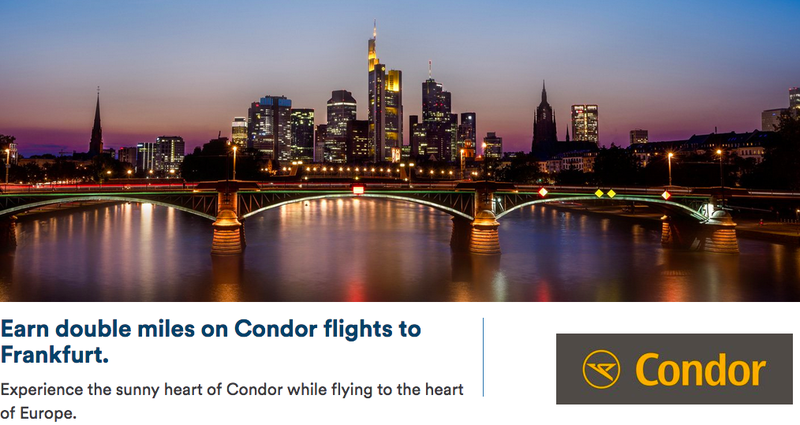 With promo awards the discount ranges from 25 to 50% off the regular amount of miles required to redeem for these flights. As you can see just by the discount this can be a very good offer if you get 50% off for Business Class! This set does see one half off business class offer from Edmonton to Europe, 25% off business class out of Calgary and 25% off both business or economy class out of Vancouver. While 25% isn't as good as 50% of course, it still is something to look at if you were planning travel to Europe in the fall. Not bad at all - 60,500 miles and $635.12 in fees and taxes for business class. Under the old promo awards this flight would have been 62,500 miles plus the same fees. Yes the fees are on the high side but most other programs who may have lower fees would be costing you at least 50% more miles. Only 58,000 miles and close to the same amount of taxes. 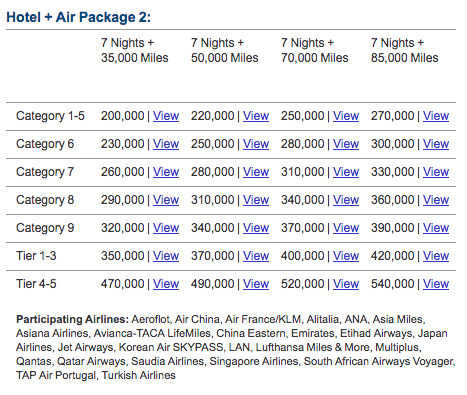 People have said that the new Air France KLM award rates make no sense and here is an example of that! That's unheard of! Only 53,000 miles to fly Business Class round trip?!? However you would need to redeem by August 17th because as of August 18 they are being massively devalued. Of course you have to have enough Starpoints/Marriott Rewards Points to do this in the first place. 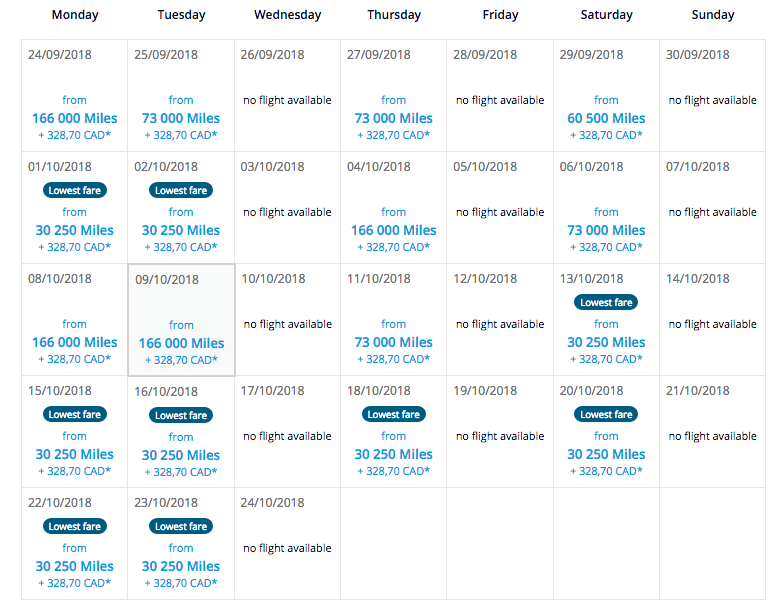 Your other option is to also do a straight conversion from SPG to Air France KLM where you can get 25,000 Flying Blue Miles for every 20,000 Starpoints so that Edmonton-Brussels flight could be had for 43,000 Starpoints! As of August 18th, you will be able to convert from Marriott to Flying Blue at this same ratio, albeit 60,000 Marriott Rewards points will net you 25,000 miles. 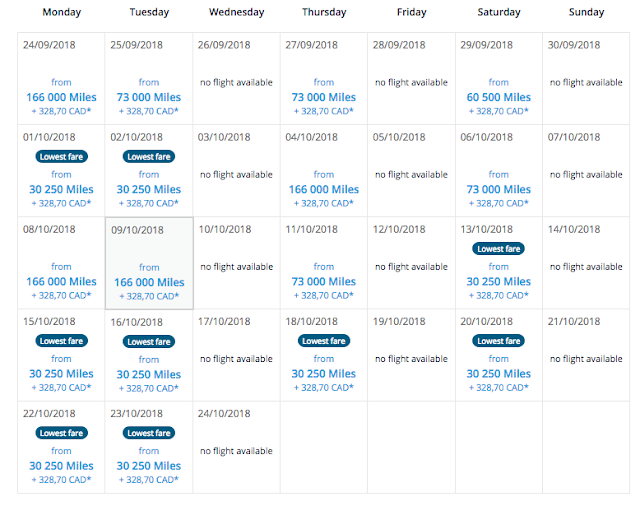 All in all there are quite a few good deals to be had with this latest Promo Rewards from Air France KLM's Flying Blue program, especially so if you can take advantage of the 50% off business class flights from Edmonton! A very generous offer for Hilton stays is out now where you can earn 2,500 Miles & More for every Hilton stay until the end of October. The great thing about this offer is that you can still earn Hilton Honors points on all those stays which means you can take advantage of the current global double points offer that runs until September 9. If you don't think you may have a use for the Miles & More miles right now I would register anyway to collect them over and above your Honors points. Just as I hit 'post' for the Aeroplan Air Transat announcement an email notification popped up with another press release from Aeroplan - "Aeroplan and Flair Airlines Announce Preferred Partnership"
Now we have another leisure airline being added and this one is an Ultra Low Cost Carrier. Part of me was hoping we wouldn't see this sort of partnership, I mean Air Transat is one thing, but Flair Airlines is bare bones where you have to pay for everything (carry on bag fees, airport counter fees etc), it's no Air Canada, it's no WestJet but again it is an airline the average Canadian who travels less than once a year would fly to visit friends or family across Canada. It once again makes sense for a portion of Aeroplan members who only collect a few miles here and there - they aren't going to earn enough miles to fly to Australia and need some closer in options. 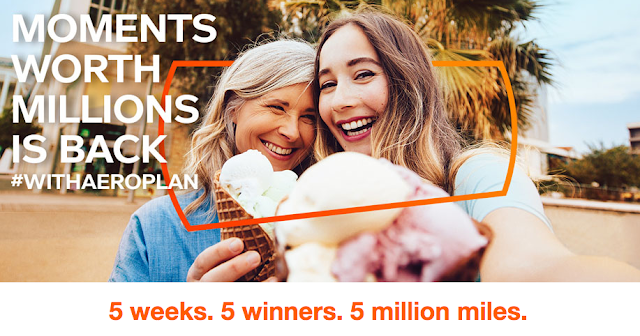 Starting July 2020, Aeroplan Members will be able to both earn Aeroplan Miles when booking flights on Flair routes and redeem for flights at fixed-rate fares. "The addition of Flair Airlines as a preferred partner airline further strengthens our air offering in Canada for Aeroplan Members come July 2020," said Jeremy Rabe, Chief Executive Officer, Aimia. "In addition to providing members with the ability to fly any airline, anywhere, this relationship with Flair will give our members exceptional value for popular Western Canada routes." When flying with Flair Airlines, a Canadian low-fare airline, Aeroplan Members will earn Aeroplan Miles for their flight and ancillary product purchases and have the ability to redeem for Flair flights at fixed-rate fares. 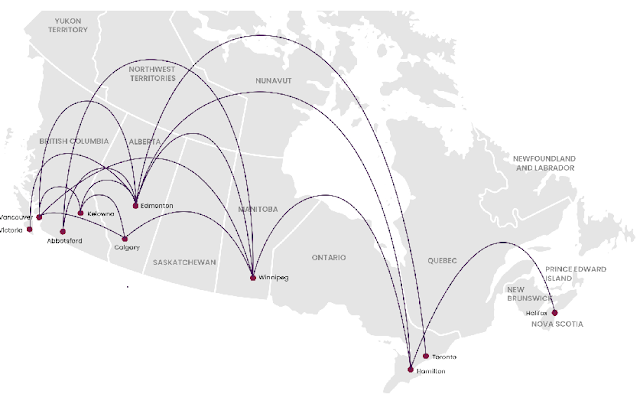 The relationship with Flair Airlines will give Aeroplan Members new redemption options, particularly those travelling out of Flair's Edmonton hub, extending from coast to coast and upcoming southern destinations. Flair Airlines is a young airline that used to be known as newleaf who have been expanding their service across Canada - however with WestJet launching Swoop earlier this year and our already existing airlines Air Canada and WestJet also competing for traffic across Canada we don't know if Flair will be around in two years, these airlines don't have a good track record in Canada (think JetsGo, Greyhound Air, Canjet). I hope they are so that there is this option for Aeroplan members but this is perhaps one bit of news I would have maybe kept under wraps just to see how the airline does over the next couple of years.